Jackie had posted this in another thread. 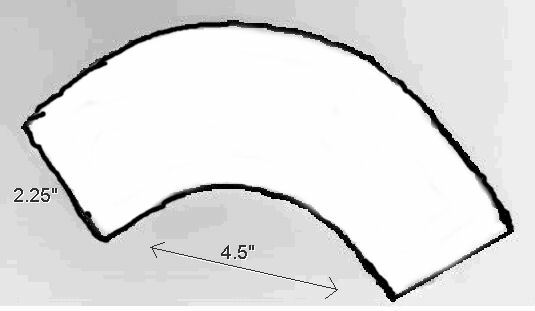 providing this graphic on making an e collar. Step 1: Trace template onto clear plastic notebook cover, then cut out. Step 2: 1 sheet Dr. Scholl's Molefoam: cut 2 strips ¼” along long edge. Step 3: Remove one adhesive strip and stick one on top of another leaving one adhesive strip for later. Step 4: Cut ¾” off of dual layer molefoam- remove backing and adhere to clear plastic as shown. Step 8: From the middle of moleskin- wrap around over molefoam, maintaining contours. Trim excess moleskin from edge. Step 10: Remove backing and adhere over slitted mole skin. Step 14: Apply a small amount of duct tape, Fold a small amount of duct tape over to make a tab for easy removal. For a true-to-size print out of this template, along with complete instructions on making an e-collar, please Click Here! Step 1: Cut a strip of duct tape about 1.5" wide, then fold 1/4" over and stick to itself, making a tab for easy removal. Set this piece aside (I stick just a bit of it to the edge of my kitchen counter). Then, cut another strip of duct tape about 1" wide, then fold 1/4" over and stick to itself. Set this piece aside also. Step 2: Place 1.5" wide strip of duct tape along edge of E-Collar, as shown, keeping folded over tab exposed at unattached end. Step 3: Having an assistant hold glider securely, wrap E-Collar around glider's neck, overlapping edges of collar, then stick the duct tape to the overlapped edge, rubbing down along duct tape to ensure secure attachment of tape. Step 4: Attach 1" strip of duct tape to inside of collar about half-way down length, as shown, keeping folded over tab exposed at unattached end. Step 5: Fold duct tape over and attach to outside of e-collar, rubbing down along duct tape to ensure secure attachment of tape. ik sugar gliders can get neutered, but i've heard that its life threatening for fs. is this true if i were to make one of these for him??? Floppy, a few members here have gotten their flyer neutered. They didn't have a problem. The reason it is not recommended is because 'some' flyers will become obsessed with the surgical wound. They will pick at it, chew it and keep after it until it becomes a life threatening problem. There have been a few flyers that died from being neutered because they ripped and chewed their flesh until it was so massive.... well... With that said, I do know of a member that has had at least 3 flyers neutered without a problem. I have chosen to NOT neuter my males. I just can't risk it. It is almost impossible to keep an e-collar on a flyer. Flyers also have a tendency to have seizures when stressed so I'm not will to try it. It's a decision everyone has to make for themselves. For me... it's a NO. Ok! I understand and I want to do the best for him without any risk. I just wanted to know thanks! Would anyone know how to wrap this around a semi-wild squirrel that has no intention of allowing you to? I assume this is a Gray or Fox? I just addressed this in another post. Try a reverse collar. Harder to pry off with a squirrels strong hind legs but must be snug between the upper ribcage and underarms. Any seam/velcro must face the spine. If it's a serious injury with risk of re-injury a mild vet prescribed sedative may help keep the squirrel calm. Not sure if you can get that in Canada - probably not. Will you be able to get it off later on? What's going on with him/her? If you are going to neuter, you better make sure your squirrel has passed sexual maturity, for a recent study in neutered rats showed that the lowering of testosterone resulted in the loss of calcium in the bones, and led to early onset osteporosis, aka MBD. If neutering is done it has to be with older males that are past sexual maturity by a number of months, in rats sexual maturitis noted to be 7 mo. and full bone mineralization at 10-months, in tree squirrels likely about 1 1/2 to two 2 years of age. It was obvious to us at that our girl's skull increased in size from one to two years of age . We had a male that the veterinarian recommended be neutered at 6 months of age due his to aggression with the female. We waited to about 8 months and the procedure went fine with no major complications. Yet in two years he passed due to what appeared to be complications from MBD, refusing to eat, but not refusing water having had blood tests which found no pathogens present. The Vet though it was an internal tumor, yet didn't do x rays to verify his assumption If he has he might have seen the evidence of MBD. He had assume that for reason altering works well for dogs and cats and dogs would result in rodents, but he was wrong!! Our girl was spayed at 7 1/2 due to getting repeated yeast infections, in a years she had symptoms of MBD having reached her spine, with degenerative disc disease due to slow onset MBD that was verified with an x-ray. If you alter these animals a significant increase in calcium is needed. The problem there is that to increase calcium using feed increase calories to much causing obesity to develop. Using inorganic phosphorus sources to support a higher intake of calcium at 2:1 some veterinarians note as risky, for inorganic forms of phosphorus hve been found to be directly related to the development of Calcium phosphate bladder stones that present in middle age. Just wanted to add that I get why folks with serious issue like self mutilation neuter males, yet with CBD there is now another option to neutering. If neutering is needful, calcium would need to be increased and the use of inorganic phosphorus to bring the ratio up to 2:1 in the whole diet. Our squirrels had a diet that included block, a mineral stone and a liquid mineral vitamin supplement added to the water, yet that didn't prevent MBD from developing, just slowed it up some. Calcium level in teh whole diet would need to be like that of juveniles and then again with a form that is far more soluble than Calcium carboante to continue to prevent further bone loss from the loss of sexual hormones. Also, magnesium would need to be increased to close ratio of 3:1 Ca:Mg in the whole diet. The easiet way to get a closer ratio of calcium to magnessium in the diet is to add magnesium a litte at a time every few days till bowel tolerance is reached (where loose stool occurs); then back down by one measure, that is either 10 mg. or a close equivolent Tsp. fraction measure, to where the bowel firm up as to return to normal pellets. This can be done wtih any diet without having to measure and calculate the total calcium and magnesium in the diet. Magnesium is also known to inhibit the formation of kidney stones, in a closer not high ratio of Ca:Mg in rats. In my diet that has a close ratio of Ca:Mg, the urine has been foud clear of any urinary calculi under a 400X magnifciation for 6 years and counting. Magnesum also supports calming the brain, often aggression is due to a magnesium deficiency in the body, as most magnesium save for the tissues of the heart, and the lining of the bones is lost out the bowel; this is why like potassium in the diet it needs to be replenished to support both the well mineralization of the bones and inhibting bone turnover. Then there is Vitamin D3, a sensitive but vital source in the diet of rodents; for too much with higher calcium can result in causes kidney stones especialy wehnteh Ca:P ratio is off, and too little lead to MBD. This is a very good idea. Thank you.